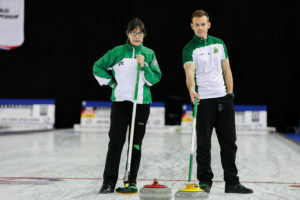 It was tough going again for the Irish mixed doubles team of John Wilson and Louise Kerr here in Norway losing to the Korean team by another bucketload of shots. The last stone draw didn’t go to plan but we picked up a one when the Koreans’ last stone clipped a guard. 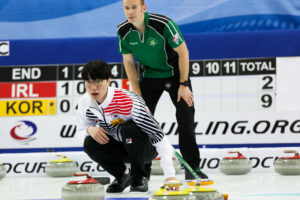 In the second end we drew shot stone with our last but Hyeri Jang got round the guard and to the inside edge to move it enough to pick up a four. We then lost five shots against the head in the next two ends, but managed to pick up another single in the fifth end with a power play. But the more accurate Koreans took a three and a single in the sixth and seventh ends. We now play England at 9pm tonight. It’s safe to say that this game had it all! Good shot making, burnt stone, pickups and sportsmanship. 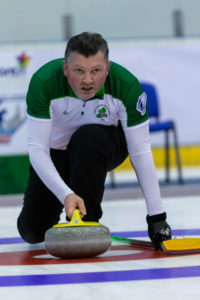 The early ends saw singles traded until the 4th where a series of loose shots by Team Ireland gave the Scots the upper hand lying three. When Scotland burnt a takeout stone the initiative swung back in Ireland’s favour but a miss by the skipper let them back in and a score of three ensued. 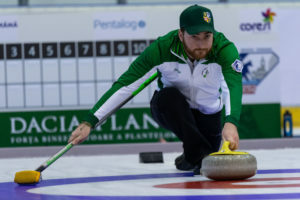 A well taken two by Ireland in the 5th tied the scores at 4-4 – where they stayed as the following two ends were blanked. Going up the last without hammer, Ireland got a few guards out front and were handily placed. Scotland played a hit and in the process accidentally kicked a stone in behind the remaining front guard. A request to replace the stone to where it would have ended up was sportingly accepted by Bill and left Ireland lying two but now with one in the open on the 8ft. Bill’s first shot – a planned guard picked up out of his hand and came to nothing and after Dave Smith the Scottish skip played a hit and roll which rolled out from behind the guard, the last Irish stone nosed the Scottish counter on the 4ft leaving the same shot for the Scots who made no mistake for a 1 point win. 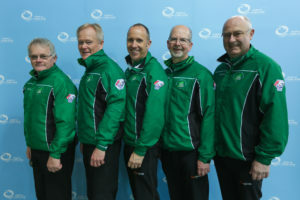 Ireland senior men. Photo credit WCF. A tough defeat but a good tight game which should set the boys up well for the coming games.Next up Suisse – at 8pm Norge time Monday. 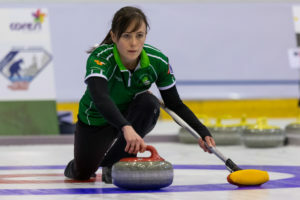 Ireland’s mixed doubles team went down in seven ends to the Kazakhstan duo who outplayed Ireland, clocking up a three and then a four in the last two ends. 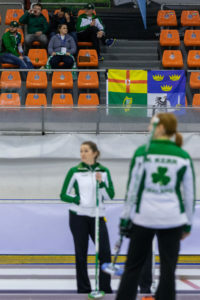 Kazakhstan started the game with a big three but Ireland got a three back in the second end. 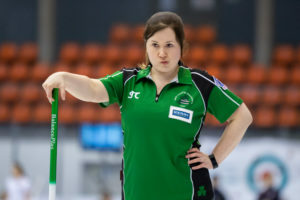 Kazakhstan then stole singles in the next two ends before Ireland got a one back. It should have been a two but my stone, drawing the four foot was a foot short. The Kazakhstanis then opted for a power play which they played very well. With Ireland’s last stone I drew shot stone half hidden behind a couple of stones just high of the house, but Alliyarova chipped it out for the three. The game was sliding away from Ireland and the opposition drew in behind the centre guard and attempted taps by Ireland just locked the Kazak stone in a cluster which we could not shift. Ireland play Korea tomorrow morning and England at night. 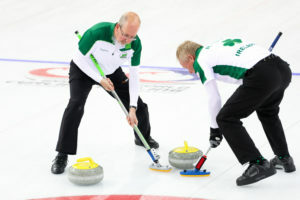 David Whyte and Ross Barr sweeping. Photo credit WCF. David Whyte, Neil and Ross playing for Ireland. Photo credit WCF. 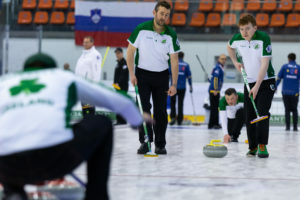 Ireland’s senior men had a comfortable victory in seven ends against Slovakia today and now face Scotland at 8am tomorrow morning. Ireland’s John Wilson. Photo credit WCF. 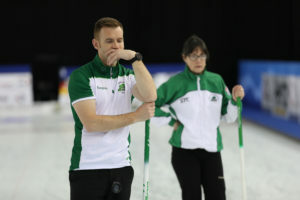 Ireland’s mixed doubles team, John Wilson and Louise Kerr, lost their first game in the world championships here in Norway after leading by three shots. Ireland’s Louise . Photo credit WCF. After playing themselves into the lead, helped greatly by a three in the fourth end, the duo ran into trouble in the sixth and seventh ends when missed shots cost them four points. 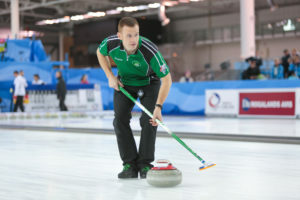 Finland’s Tomi Rantamaeki played a superb draw in behind cover to put Ireland in Trouble in the last end to chalk up another steal of two for Finland. 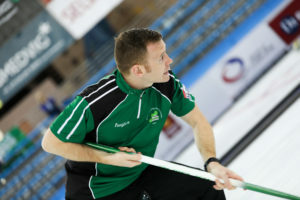 The team play Kazakhstan at 8am tomorrow morning. 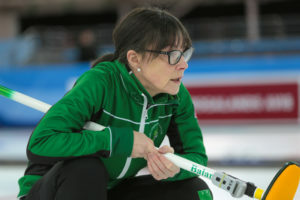 Ireland have duel representation at the World Seniors Championships in Stavanger, Norway, which begins tomorrow. 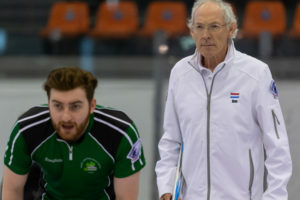 The men’s senior team consists of Bill Gray, David Whyte, Neil Fyfe and Ross Barr and the Mixed Doubles pairing of John Wilson and Louise Kerr. PJ Wilson will act as fifth man for the seniors and coach for the MDs. The seniors first game is 12 noon (Norway time is BST+1hr) when they play Slovakia. They then play Scotland on Sunday, Switzerland on Monday, Japan on Tuesday, England on Wednesday and Poland on Thursday. 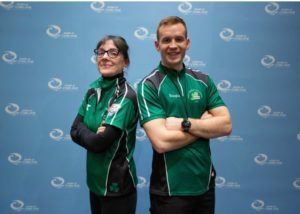 The Mixed Doubles team face Finland at 12.30pm tomorrow then Kazakhstan on Sunday, Korea and England on Monday, Saudi Arabia on Tuesday, New Zealand on Wednesday and Qatar on Thursday. We will do our best to post reports of the games while we are here as long as the coach says we can! 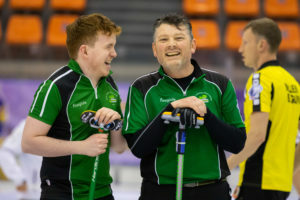 As our Irish men and women head home from Romania, here are a few more of the excellent photos taken by the WCF’s professional photographers. The Irish teams. Photo credit WCF. James with the opposition skip. Photo credit WCF. Jacqui and Katie sweep hard. Photo credit WCF. Jen concentrates on the line. Photo credit WCF. James the lefty. Photo credit WCF. James watches his stone head for its target. Photo credit WCF. The men’s team are ready for action. Photo credit WCF. 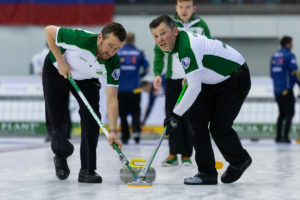 It’s a changing of the guard time, as the C Division teams head home, the Irish men’s senior team – Bill Gray, David Whyte, Neil Fyfe and Ross Barr – and the Irish Mixed Doubles team – John Wilson and Louise Kerr – are heading to Stavanger tomorrow to represent Ireland in their respective world championships. 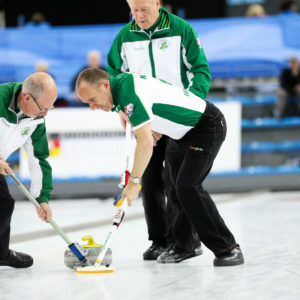 Irish skip James on the ice with Steve and Eoin sweeping. Photo credit WCF. 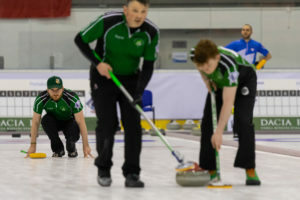 Ireland missed out on the medal games at the European C Division 2019, in fifth place on a five win, four loss record. 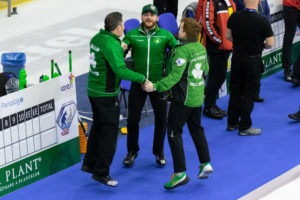 The team – James Russell, Arran Cameron, Steve Callan and Eoin McCrossan – missed out on the play-off stage by one place and were unfortunate to meet the strongest team, France, in the last game, which they needed to win. Arran and James in the head. Photo credit WCF. The men never really threatened the French, who went through the round-robin stage undefeated and now play Bulgaria for the gold tomorrow. Where’s Arran? Photo credit WCF. 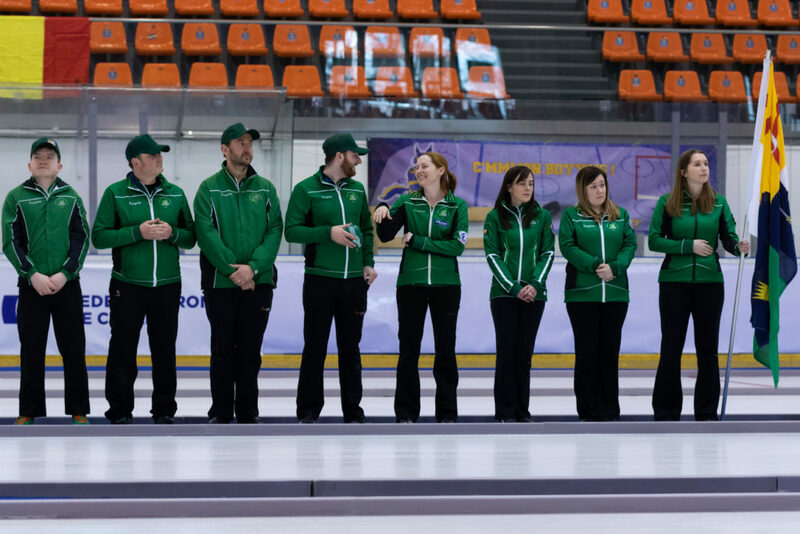 Well done to the team and coach who have left it all on the ice for Ireland this week. 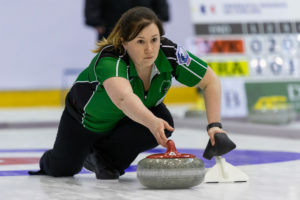 Ireland’s Jen Ward. Photo credit WCF. 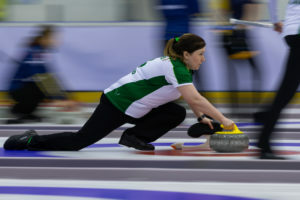 The Irish women’s team bowed out of the European C Division after losing their last game to Slovakia. Fans in the stands. Photo credit WCF. 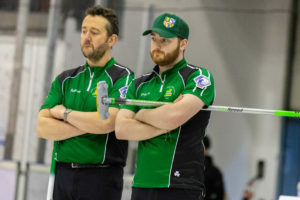 The team were in control for most of the game, having a three shot advantage at one point but bled shots in the last three ends to lose by three shots. Ireland skip Alison Fyfe. Photo credit WCF. 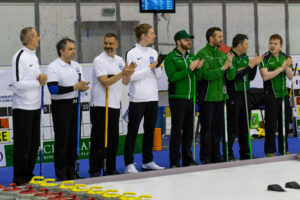 Although they have the same win loss record as Austria, who qualified for the medal games, they lost out because Austria had the better draw shot challenge, by 4.5cm. Jen studies the options. Photo credit WCF. Well done to all the members of the team and their coach, who have given their all for Ireland. Eoin is a study in concentration. Photo credit WCF. Sweepers Arran and Steve. Photo credit WCF. 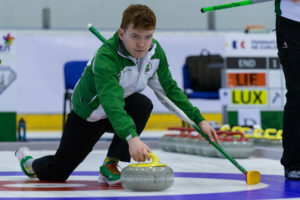 A solid finish to the game taking a two and then stealing a two gave the Irish men their fifth victory out of eight at the Euro C Division in Romania. James, Arran, Steve and Eoin all in the same picture! Photo credit WCF. The men are now fourth equal in the league table with hosts Romania. 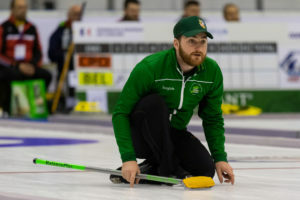 In the last round robin game this evening, Ireland play undefeated France while Romania play Greece.